This joyous occasion of Rakhi shop online from our collection of Raksha Bandhan gift hampers and makes your brother feel special and loved even if he is sitting in another part of the world. Arrange for fast and effective delivery through us and send Rakhi to Los Angeles just to convey your warm wishes and affection to the best brother in the world. Rakhi is the most special celebration that is commemorated between brothers and sisters expressing their love and affection for each other. This year send Rakhi to Los Angeles and have a wonderful celebration with your beloved brother in spite of him being some thousands of miles away from you. Shop from our online Rakhi gift hampers and make a Rakhi delivery to Los Angeles right on time to surprise your darling brother on the D day. We can offer you some of the best Rakhi goodies as compared to the Rakhi shops in any part of the world. Indulge in the best quality and the most delectable sweetmeats and confectionaries send a hamper of love and pamper to your brother. We can arrange for you to send Rakhi to Los Angeles to your brother, who is surely missing his family, home and you – his sister the most on this day. Our services of Rakhi delivery in Los Angeles beat the distance between you and celebrates the day just as much with your brother. 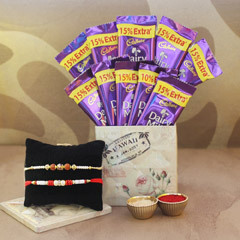 Our array of gift combos and hampers combines stylish silk Rakhis with some of the most sumptuous chocolates and assorted nuts. So select health and happiness for your brother this season.